The Primary Healthcare Initiative in Trinidad and Tobago, jointly coordinated by the Ministry of Health and the United Nations Development Programme (UNDP), has come to an end after three successful years. With a medical team comprising 28 UN Volunteer Doctors, one international health officer and one international bio-medical engineer, the project was designed to fill the gaps in service delivery in under-served rural areas and provide primary healthcare to vulnerable communities of Trinidad and Tobago. 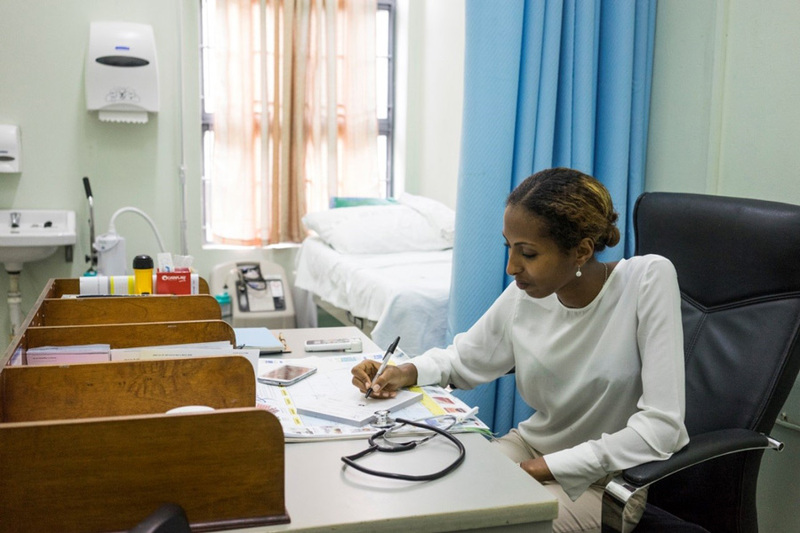 UN Volunteer Doctor Samwarit Gebremariam working at the Roy Joseph Health Centre, San Fernando, Trinidad and Tobago. Healthcare in Trinidad and Tobago is delivered by both public and private institutions. Primary healthcare facilities are located throughout the two islands and provide most of the population coverage for preventative programmes. These programmes include maternal and child health services, chronic disease clinics and health education. However, due to the migration to foreign healthcare markets and to a shift away from the public sector, Trinidad saw a shortage of professionals, particularly in rural communities. Private doctors on the island account for 54 percent of curative primary care. In 2014, UNDP partnered with the Ministry of Health, whose policy priority was to address the issues of poverty and access to basic social services. In total, 28 UN Volunteer Doctors, one Healthcare Officer and one Bio Medical Engineer were recruited for the project. Dispatched in different health centres across the island, UN Volunteer Doctors supported local practitioners and provided eight hours of service daily. On average, this means that they were seeing approximately 32 patients per day and 160 patients per week, which translates to approximately 7,680 patients per Doctor per year. Based on the skill sets of the UN Volunteer Doctors, some of them were placed in centres focusing on HIV/AIDS and Sexually Transmitted Infections clinics. With about 11,000 adults and children living with HIV in Trinidad and Tobago (UNAIDS, 2016), doctors also insisted on dealing with issues of stigma and discrimination in the communities they worked in. In addition, many of the International Volunteer Day activities in the first two years of the project focused on these areas as well to bring about awareness and conduct free and rapid HIV/AID testing. According to the UNV Programme Officer, Nicole Dagher, UN Volunteer Doctors made sure to use a patient-centric approach during their service. Their priority was to spend time with patients, to explain terms and ensure that patients understood their charts and what was being prescribed and administered. A couple of patients wrote afterwards to the respective health centres and a local newspaper to manifest their appreciation and gratitude. In addition, one of the UN Volunteers was awarded a certificate of appreciation by the Eastern Regional Health Authority. Overall, the project also successfully planted the seed of volunteerism through the involvement of UN Volunteer Doctors in community outreach, the provision of support to partner agencies of the Ministry of Health and NGOs, and the development and implementation of volunteer activities. With the increase of graduate and local doctors, the project was no longer needed in its current phase. UNDP and UNV are looking for other ways to continue their engagement, including through institutional strengthening while ensuring volunteerism remains an integral component.